Vancouver, Canada – Mawson Resources Limited (“Mawson” or “the Company”) (TSX:MAW; Frankfurt:MXR; PINKSHEETS: MWSNF) is pleased to announce the commencement of the 2018 winter diamond drilling program with the arrival of four rigs on site in northern Finland. 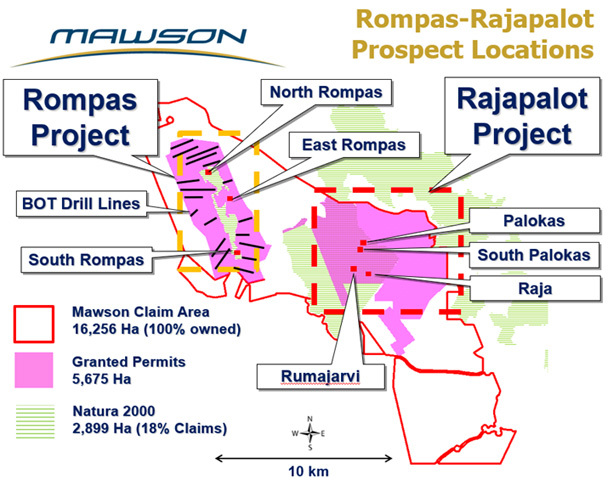 A 15,000 metre drill program is planned at the Rajapalot gold project, while a 900-hole base-of-till drill (“BOT”) program is now underway at the nearby Rompas gold project (Figure 1). Eight diamond drill holes totalling 1,474 metres have been completed at East Rompas. Assay results from the first 5 holes show low tenor gold anomalism and locally nuggety visible gold in drill core. Three diamond drill rigs are now active at Rajapalot. An additional two rigs will be mobilized from mid-March to allow the 15,000 metre target to be achieved before winter conditions end in late April. Drilling during 2017 at Rajapalot tested only a small fraction (<5%) of the 27 kilometre strike of the interpreted host sequence, successfully confirming the presence of a large gold-mineralized hydrothermal system across a 4.5 square kilometre area. Rajapalot demonstrates an exceptional rate of drill success through thin glacial soil cover, with 42% of holes (58 out of 137 holes) discovering significant gold, greater than 1 g/t-m, and 28% recording greater than 5 g/t-m intersections. The total average drill depth on the project today remains shallow at 109 metres. Nine hundred BOT drill holes, drilled over 19 traverses totalling 23 line kilometres, will map the full north-south extent of the Rompas project (Figure 1). The program will test for disseminated gold targets similar to the high-grade Rajapalot style. These targets will then be ranked and diamond drilled as appropriate. Diamond drilling of 8 holes for 1,474 metres to test the extent of high grade outcrops at East Rompas (see news releases Oct 23 2017 and Jan 08 2018) has been completed (Table 1). Assay results from the first 5 drill holes have been received with only low level anomalous gold detected to date. Conductive targets drilled were structurally-controlled, sulphidic bituminous rocks. 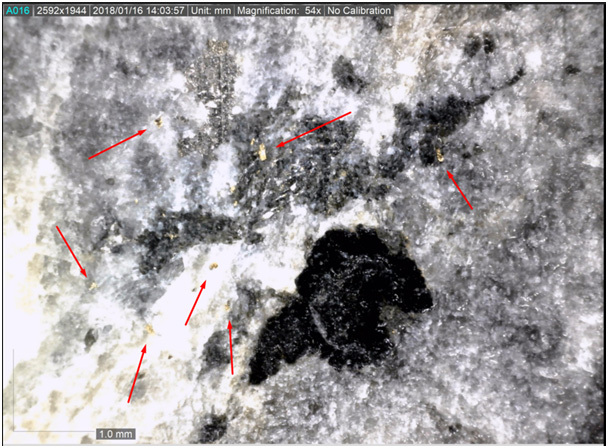 An occurrence of visible gold in drill core (ROM0089 @ 31.2 metres; see Figure 2) demonstrated the nuggety nature of the East Rompas gold mineralization. It is likely that the high-grade gold in surface samples discovered at East Rompas are the deformed eastern extension of the Rompas calcsilicate-hosted vein system. Hydrothermal gold transport of the same age as Rajapalot gold deposition (approx. 1.8 Ga) is evident, but the structural-stratigraphic traps required for larger grade-width intersections were not intersected. Due to a lack of continuity beneath high grade outcrops, prospectivity of the immediate surrounds of the prospect are reduced and the immediate surrounds of the East Rompas prospect are considered adequately tested. However, the prospectivity of the 20 kilometres of strike remains high and is the target of the current 900-hole BOT drill program. Drill core for the East Rompas prospect was drilled by MK Core Drilling of Ranua, Finland and transported to Mawson’s facility in Rovaneimi. Drilling at Rajapalot will be commenced with two drill rigs from Arctic Drilling Company (ADC) and the third from MK Core Drilling. The core is oriented and marked for RQD and logged by Mawson staff. Half of the drill core is diamond sawn by GTK in Rovaniemi and bagged for assay. The same half of the drill core is consistently sampled to prevent any sampling bias. Analytical samples were transported by Mawson personnel or commercial transport from site to the CRS Minlab Oy facility in Kempele, Finland. Samples were prepared at Kempele and analyzed for gold at Raahe using the PAL1000 technique which involves grinding the sample in steel pots with abrasive media in the presence of cyanide, followed by measuring the gold in solution with flame AAS equipment. The QA/QC program of Mawson consists of the systematic insertion of certified standards of known gold content, and blanks within interpreted mineralized rock. In addition, CRS inserts blanks and standards into the analytical process. The true thickness of mineralized intervals at Palokas is interpreted to be approximately 90% of the sampled thickness. The true thickness of the mineralized intervals at Raja and South Rajapalot, will require additional drilling to determine due to the complicated structural controls. Figure 2: Visible gold interested at 31.2 metres in ROM0089 at the East Rompas prospect. Only anomalous gold was returned in assay. View next February 7th, 2018 Mawson Announces C$8.1 Million Strategic Investment By Goldcorp Inc.